Every review of a Volvo in India will predictably end stating that the car is excellent but the dealership network spread isn't so it's safer to stick with the established German brands. Let's get that out of the way right here. Yes, buying a Volvo in India is largely an emotional process but the V40 is a car that tugs at the hems of those emotions extra hard. It's drop dead gorgeous, so pretty to behold that after a day of longingly staring at it ,I can't get it out of my head. 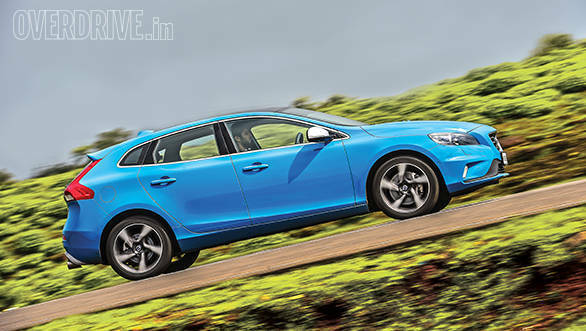 In this racy shade of blue, the long, wide and low V40 borders on exotic and my day with it was repeatedly interjected by the kind of gasps and whistles from pedestrians that only a flashy sportscar can conjure. Oh yes, that's how handsome this car is. Try as I might, I couldn't find a bad angle on the V40. Those slim headlamps complement the long, fluid lines but there's also a good helping of muscle in the design. For example, in the bulge above the front wheel arch where the bonnet meets the body, or the rising beltline that merges those unique boomerang shaped tail lamps. The striking window line grows narrower towards the rear all while the roof swoops down in an almost coupe-like gradient. There's also an interesting concave curve between the boot and the lights that gives the car the impression of being hunkered down, on edge and ready to pounce. The spoiler only amplifies the drama. Add in the fact that this R-Design edition gets sporty bumpers, that attractive panoramic sunroof and larger 17-inch wheels (an inch up) and you have a car that looks like it's going a million miles an hour even when it's perfectly still. 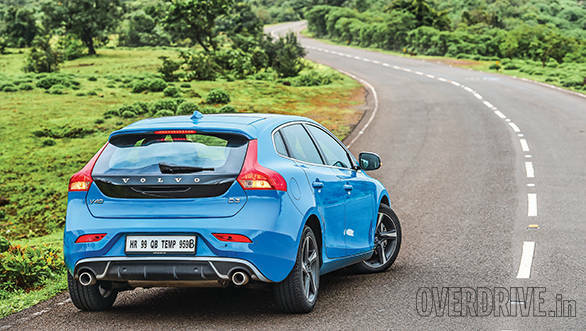 The V40 is quite a long car, as long as your average Rs 10 lakh sedan but it is considerably wider and sits deliciously low. Easily the best looking hatch in the country to my eyes and no, I haven't forgotten the delectable A-Class. The interiors feel familiar and aren't quite as radical as what you see outside. 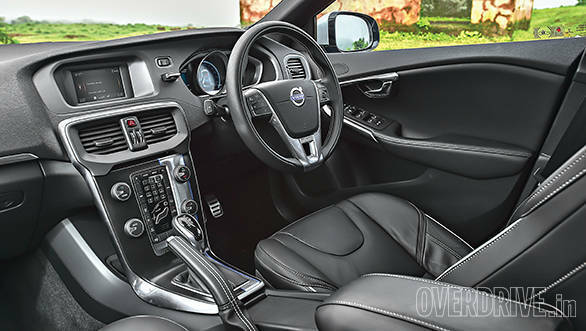 Volvo's trademark floating centre console continues and it has those likeable humanoid shaped aircon controls. The driving position is comfortable and all the controls fall to hand well. I like the fact that the seats not only manage to be both soft and enveloping but also offer good support in the corners. 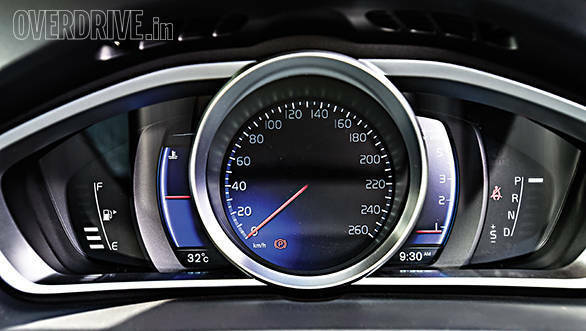 The all-digital instrument cluster with swappable themes was state of the art when it debuted a couple of years back and it's still very nice but not quite as sharp or comprehensive as the fantastic unit in the new Audi TT. In an attempt to lower costs, the V40 gets a smaller 5-inch screen on the centre console against the Cross Country's 7-inch display. Also, there's no reverse camera -- that comes for an extra Rs 71k. But the Volvo does come with a usable automatic parallel parking feature that makes all the steering and throttle inputs for you while you just have to control the brakes. It may not have the extroverted design of an A-Class but this is a high quality and well thought out cabin. The dramatic roofline and tiny windows don't make for a very comfy rear space. Head room is at a premium and knee-room is just about acceptable. A high centre tunnel also makes it cramped for the middle passenger. I wouldn't mind spending an evening around town in the back seat but long drives would get tedious. 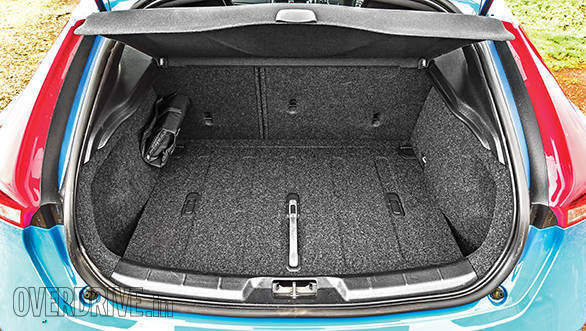 Boot space is reasonably spacious and should swallow light luggage for four. 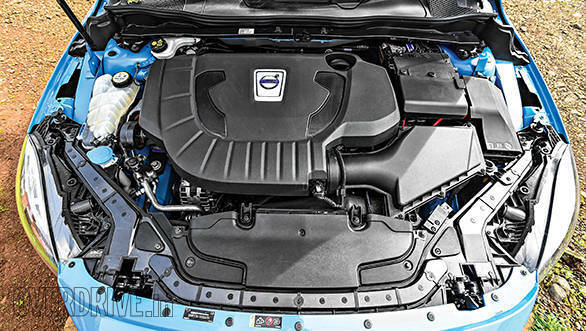 Volvo has a new four-cylinder powering the V40 internationally but we get the old five-cylinder motor. That's not bad because the five-pot has plenty of character and makes 30Nm more torque than the new motor. The 2.0-litre motor produces 150PS and 350Nm in this state of tune which makes it more powerful than both the A-Class (despite recently being replaced with the A 200 CDI) and the BMW 1 Series. The engine is also refined and produces a smooth thrum that's interjected by subtle turbo wastegate noise on throttle lift-off. There is some lag at low revs but beyond 1,700rpm, the power comes on and it gets surprisingly strong at about 3,000rpm before tapering off at just under 4,500rpm. It's a surprisingly strong shove of power and makes the V40 feel involvingly quick. The gearbox is a 6-speed torque convertor but it feels quicker than some of the older Volvos. In Auto mode, it shifts up early but stick it in Sport and it holds onto gears till the redline. It also offers quick and smooth downshifts under hard braking which helps cut down speed quickly while staying stable. The engine and gearbox work in such unison that it's a shame there are no paddle shifters on offer - manual shifting involves nudging the gear lever forward and back. Flat out, we recorded a 9.2 second run to 100kmph and a top speed of 204kmph. Respectable numbers, but what sweetens the deal is the overall efficiency of 13.9kmpl. This is the last Volvo that is based on a Ford platform thanks to the erstwhile relationship between the two manufacturers. The Ford in question is the Focus, a hatchback renowned for its love for squiggly roads. As a result, the V40 has a wonderfully composed chassis and the front end is surprisingly sticky. You can throw it into a corner and it just holds a line without a hint of protest from the super quiet Michelin Primacy tires. There's so much grip on offer it's easy to wonder if the car is actually all-wheel drive. The only fly in the ointment, and there's a lot of ointment here, is that the steering begins to feel a little light when you really get on it. It's a minor issue to be honest, one quickly forgotten while hustling the V40 through a mountain road. Ride quality is firm but also well damped and reasonably kind on the back and kidneys. I was rather worried about the low 133mm ground clearance (I did say it borders on exotic!) but with a little care, the V40 never scraped its belly. Most certainly, this is a seriously likeable car. Just the thought of it sitting there in my garage would put a big silly smile on my face. 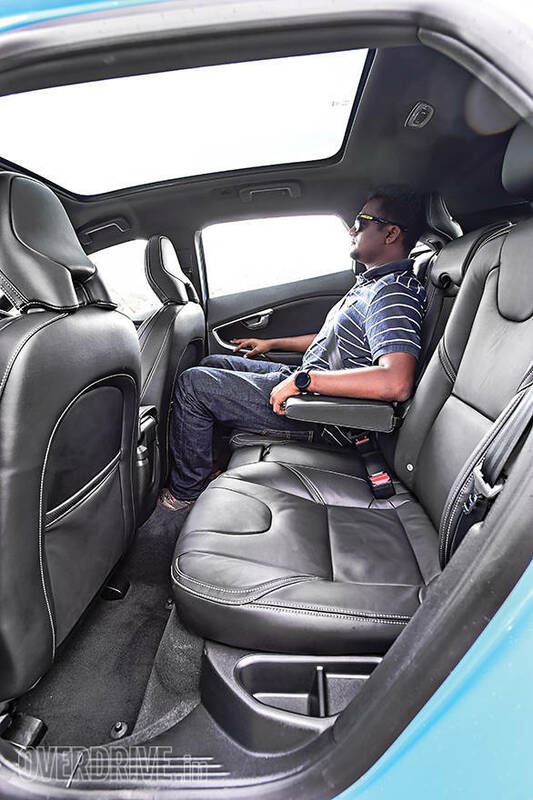 There's also Volvo's legendary safety to consider and the V40 packs an army of airbags as well as the laser based city safety system that can automatically brake to avoid an accident. But does it make for good value for money? Most Volvos do and they're generally priced lower than the Germans. Not so here. The base Kinetic costs Rs 33.7 lakh (all prices on-road Mumbai) but it loses out on quite a lot of features like the panoramic roof, keyless entry-and-go, folding RVMs, bending headlamps, cruise control and rain sensing wipers. It's the R-Design you will want, but that will set you back by Rs 37.3 lakh which is about Rs 60,000 more than a Mercedes-Benz A 200 CDI. I believe the car is worth the extra money, not just in terms of the tangible but also because the Volvo is such an easy car to fall in love with. All told, the buying decision remains an emotional one, but then some of life's best decisions are just that, aren't they?